The show house, that is. I’m a follower of Jennifer Boles’ marvelous blog, The Peak of Chic, Musings on Stylish Living. This despite the fact that I proudly display the sign “Horsework before Housework” in the Victorian cottage that’s part of my farm. 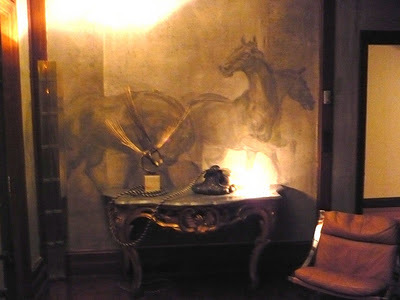 As a counterpoint to my horse habit, back in the ’90s, I restored period houses professionally. I share Jennifer’s love of the English Country House and her love of charm, that attribute so ill-adapted to the Age of Vulgarity in which we live. But I must put my tear-kissed, embroidered handkerchief away and get back to the topic at hand: horses! What a spectacular lamp. 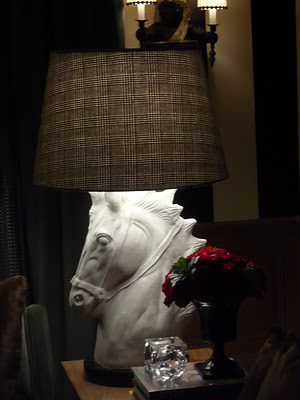 I’m not sold on the shade, but I love the drama of the sculptural horse, and you know that I’m a fan of grays. 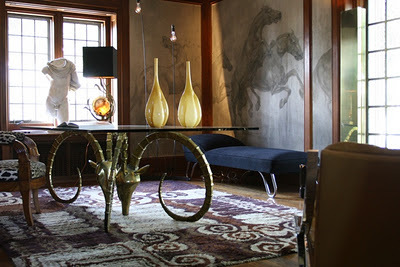 This one is in “The Gentleman’s Study” designed by Patrick Dragonette. According to Jennifer, being in “The Sitting Room” was like being “surrounded by galloping horses.” I’m imagining that’s without a soundtrack, but I’d be thrilled to have a room with a mural designed by Atlantan Raymond Goins, and I’m imagining that I share that feeling with Jennifer. It was William Morris (no relation to George) who said, “Have nothing in your house that you do not know to be useful or believe to be beautiful.” And the same can be said of your barn. Luckily for those of us with horse barns, that’s always the way it is. Oh wow, I LOVE those murals. WANT!